“Ernie let’s me watch TV!” I have made it a policy that when I’m caregiving Mommy (Patricia Hill), there is “No television until after meals and meds.” Though lately, I’ve been bending the rules. Mommy is referring to an older brother of mine, who has a more relaxed mode of taking care of her. 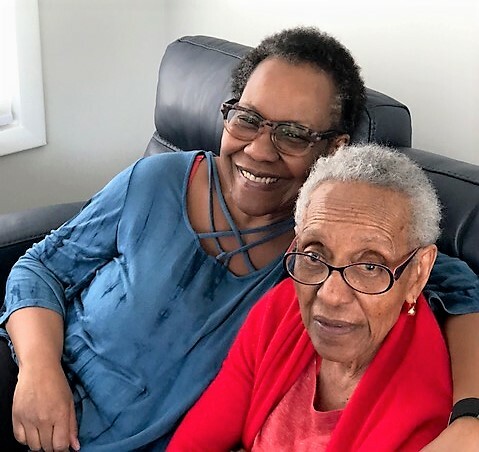 If Mom had her druthers, she would park herself in front of the television all day and hungrily consume Turner Classic Movies, Music Choice Jazz and Blues stations, nature offerings and cartoons on PBS. Under ordinary circumstances, at age 90, Mommy would truly be a “golden girl,” enjoying old age. She was, however, stricken with Alzheimer’s disease about ten years ago. This devil stole Mom’s short-term and much of her long-term memory. After Dad died eight years ago, we children assumed caregiving. My younger sister is the primary caregiver. She shops, cooks, cleans for Mommy and manages her finances. Over time we realized the load was too heavy for my sister, so she enlisted the help of the housekeeper, who now doubles as a part-time home attendant. We siblings split up nights with Mom. Now she requires more assistance with bathing and dressing. We serve her meals, get her ready for her daycare center, and bed, and keep the kitchen tidy. Mom’s dementia sometimes makes her say things that are inappropriate. But she’s still with it. That’s my Mama! The morning ritual starts with a big hug. Then we make the bed. Next is a potty run. Then we head downstairs for Mom’s shower. I put a large dollop of green soap on her washcloth, and remind Mom which places to wash. She bathes. I help her dry off. 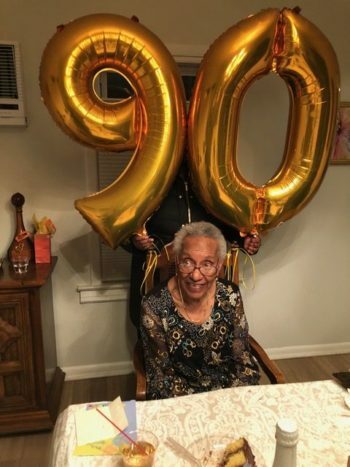 At 90, Mommy still has a figure most women would envy. I apply lotion and deodorant. “Why do I have to get all lotioned up? Am I going to meet God?” Mom asks one morning. I reply, “Not yet.” But that’s a germane way of thinking for a person of her advanced age. “Your lotion smells good, like coconut,” I say. “Who do I have to smell so good for?” Mom asks. “For yourself,” I respond. Mom has dry skin, which left untreated, causes her feet to get scaly. She claims it doesn’t hurt her. I hand Mommy her garments one by one and help her robe. Once Mom is dressed, we have breakfast. For Mom, it’s red, black and blueberries to aid her mental acuity, topped with two slices of cinnamon toast with butter, which she loves. On April 20th, Mom didn’t request the television be switched on until she was almost finished eating, a slow process punctuated with my pleas for her to take her medicine. I’ve even resorted to making Mom’s pill-taking amusing. All of her pills have an ethnicity, I’ll ask Mom to swallow “the whitey and the Chiney man,” as they used to say in Saint Martin. Even though I’ve created a game, taking her meds is serious business, as I tell Mom they help keep her “fit as a fiddle.” Thankfully, Mom has what my sister calls a “rock star” neurologist who gives her the perfect cocktail to keep her functioning smoothly. Between the four children and the home attendant, Mom is very well cared for, to say the least. Mom goes to an adult day care four days a week, church on Wednesday and Sunday, and rests on Saturday. My eldest brother’s wife and college freshman son round out the care complement. So we’re able to keep Mom at home, where she thrives and is most comfortable. “This must be what Hell is like!” Mom muttered about eight years ago. She knew she was losing her memory and some of her functioning. Over time, Mom stopped answering the telephone. I’m sorry her condition has deteriorated, but we’re glad she’s still with us. Mommy has a firm, unshakable belief in God, and I know this helps her cope with her diminished capacity. She prays for all of us, including our former significant others, every night. “Am I going to get gold shoes when I get to Heaven?” Mom asks one morning as she ties her silver sneakers. “Will God help dress me?” Mom asks as I guide her arms into her purple top. “There are too many people in heaven for God to help dress every one of them.” Then I reconsider and suggest there might be time zones in Heaven, and people wake up at different times, and thus God can then assist them all. Mom seems reassured. Due to her loss of short-term memory, Mommy repeatedly asks questions like did Jesus have siblings, and if we, as a family, own a business. “When is Blackie going to get his share?” she muses. Truly a race woman, as writer Toni Morrison adroitly coined it, Mom is so proud that this country actually elected a Black president, Barack Obama. Mom loves the former First Lady Michelle and all of the Obama family. Like many Americans, Mom is also bewildered by the fact that Donald Trump is now our president. But Mom’s most frequent query is, “How long since your father passed?” She misses him greatly. “Ma, there is no ‘separate but equal’ in Heaven. Besides, God is Black.” Mom likes that. 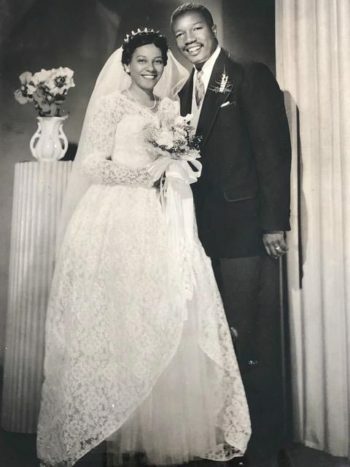 Mom’s bridegroom, Arthur Hill, Sr., was a heavy hitter – a high-ranking official in the New York City Police Department, then a vice-president at United Parcel Service. In his honor, Mom’s street has been renamed “Arthur Hill Way,’” which I point out to her when we take our afternoon walk. Mom was a good wife who was always at Dad’s side at society functions. She is also a wonderful mother. Mom did all she could for her children, making sure we had music lessons, ice-skating, and involvement in Black family organizations such as Hansel and Gretel. Both she and Dad stressed the importance of education, and she has four intelligent, news-addicted children. I am a retired public librarian. When working, my boss used to marvel that all four children in our family help out with Mom. “Usually one child ends up having to do all the work,” she would frequently assert. Not in our case. I must admit, though, that often it is difficult for me emotionally to leave my comfortable abode in Brooklyn and trek on public transportation to take care of Mother in Queens. Sometimes I resort to taking a pricey Uber taxi if I’m late for my shift because of this reluctance. When I do get to Mom, I confess to you, dear reader, that I’m often wooden and automatic with her. I feel guilt and shame about this because Mom was always there for me, especially when I was first diagnosed with mental illness as a teen, and in college, with the ensuing traumatic episodes. But the next morning with Mom, I ‘m back to my warm, loving self, and we’re having fun. I love my Mother very much, and I’m grateful for this chance to get to know her better. I wouldn’t have it any other way. For Mothers Day, let’s remember to thank the beautiful Black women in our lives who nurtured us. If your Mom is still alive, spend the day making her feel special to let her know just how much she means to you. And to my beautiful Mom, bonnets off to you! 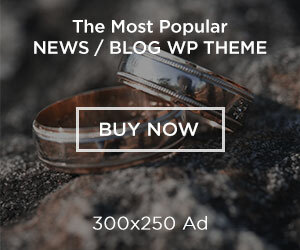 Next articleJust have the party!